Today is World Toilet Day: A fact that seems to amuse a lot of people. Living in North American, it can be pretty easy to take toilets and running water for granted. Bathrooms have become such an integrated part of our daily lives and routines, it can be hard to imagine not having regular access to a toilet. Perhaps on a camping trip, or in a particularly deserted area of town one might be inconvenienced temporarily, but on the whole most of us have a reasonable expectation of having access. As such, it might come as a shock to learn that 1 in 3 people in the world, do not have safe and adequate access to toilets or running water. Running water and the flushable toilet were not just breakthroughs in convenience and comfort. The development of the toilet meant serious progress in overall public health. I’m actually sort of upset that internet hate groups have managed to co-opt the matrix red pill analogy. It is actually a really good metaphor for social justice and the way that becoming aware of privilege and systemic injustice works. It really is like suddenly opening your eyes and realizing that everything you thought you were seeing you were actually seeing incorrectly your whole life. It’s incredible. Where the analogy fails is by painting it as a single pill. The truth is that becoming aware of social justice issues is really like swallowing a whole bunch of different red pills, each one exposing you to yet another level of interconnected systems of oppression. This is why we get some atheist activists, and other social justice activists, falling into this same trap over and over again of thinking that they couldn’t possibly be sexist, racist, transphobic, classist, etc. because they “already swallowed the red pill” so now they could see the whole truth. There is also this idea that swallowing one red pill makes every additional one easier to see, but that’s not true. Sometimes you can swallow multiple red pills at ones at once. But the truth is that each one is painful to take. Each one produces its own side-effects, its own difficulties. Swallowing the red pill is never easy. It’s not just one easily exposed system that once you see a part of, you essentially get an idea of the whole. It is more like a self-replicating computer virus that infects different system files. You can cut one out, but unless you get them all, it will just rebuild again.To really solve the problem, you have to root out every single individual corrupted system file. Otherwise, the program rebuilds itself, just using a different pathway, but ultimately yielding the same result. Take the evolution of feminism throughout the years. Each wave of feminism exposed layers of patriarchal oppression, however, by failing to consider the interconnections of various issues and the level to which the system was self-replicating, rather than fixing the problem is shifted the scope of it. Such as when the response of women trying to prove that they were every bit as capable in “masculine” fields and tasks ended up reinforcing the gender binary. The focus was on showing that women can also do “masculine things” rather than on showing that the division of actions into an either or option was not based on an accurate social model of gender. The resulting surge in femmephobia reinforced a lot of harmful patriarchal concepts that are now that much more difficult to dismantle. It’s not that second-wave feminists went too far, it is that they didn’t go far enough. It failed to take into account how the system is also supported by race, by cis-centrism, by ableism. It failed to look at the matrix as a whole. Imagine if the matrix actually existed as a series of levels. With every successive pill you see a little more of the matrix. But if you don’t realize there are more pills to take, you might be tempted to think you see the whole matrix. Agent Smith is counting on that, because as long as you believe you are outside the matrix, they can use the parts of the matrix you are still connected to to shift your perception of the world around you. As long as you are still within levels of the matrix however, you continue to power the system. If we take the premise of the matrix movie that human beings are being turned into a potato battery, becoming aware of different spheres of oppression is like discovering that your potato battery is charging other batteries and working to shut off those batteries so that your battery doesn’t die. Those are the first red pills you usually take. The hard pills to take are those that reveal that even while you are struggling to unplug the connections that are causing other batteries to drain your charge, you are recharging your own battery from other people as well. These are the pills that make us choke, that stick in our throats. These are the ones that make us want to fight and reject what we are seeing, because more than anything the matrix relies on our denial that we could be harming people even if we have no intention to. You didn’t know. The plugs were in your back and you couldn’t see them because you were in the matrix level whatever. But intentionally or not, you have been draining other people’s batteries. Whether you knew or not, you may have been the connection that added just that extra little drain needed to completely empty someone’s battery. So now you have to make a decision, which do you pull out first? The ones draining others or the ones draining you? Or do you try to pull them out at the same time? Do you leave others to try and pull out the ones draining them out themselves? Do you go back to pretending you never saw the ones in your back or deny that they’re there? Do you address some but not others? What makes you decide? The choice you make is ultimately yours, but the one you make says something about you as a person. My choice is striking a balance between pulling out both sides. I need to pull out my own because I can’t take out the system if my battery is completely dead. But I also need to work on pulling the ones that are charging me. Sometimes, when my battery is draining too fast, I need to take a break. I might need to focus on pulling out my own for a few moments, though I never forget about the ones in my back. Sometimes, I am being drained slow enough that I can forget about pulling out my own for some time in order to focus more on pulling out the ones that I benefit from. In fact, often when I am puling out my own, it is so that I have the surplus energy to spend more time pulling out the ones that charge me. Everyone is interconnected into the system, but not everyone carries the same number of output and input energy. Some people only have maybe one or two output cabled, while being charged by several sources. Even when this happens, you might not be retaining a high charge, but that doesn’t change the fact that you are still draining others. The opposite extreme also exists with some people being almost completely output cables and none or almost no input cables. The system is like a web and everyone is plugged into it. It is essential that we all disconnect and break the system. When you have any system that depends on batteries basically sharing charge in a single continuous system, that leads to combustion. Just ask anyone who has had keys and batteries in their pocket, and ended up with burning pants because the two connecting created a single circuit. The system is a path to destruction as long as it exists because either your battery gets completely drained or you combust. That’s ultimately why systems of oppression like patriarchy end up hurting even those they privilege. There is an argument that crops up from time to time when you argue on matters of social justice on the internet. No matter the subject, at one point or another someone will say that this problem has already been solved because some specific thing has happened. We no longer need feminism because men gave women the right to have jobs or have the vote. We no longer need civil rights because white people gave people of colour the vote, and interracial marriage is allowed. Or because slavery is over. We no longer need to worry about disability rights because the abled have made laws about accessibility and not discriminating. For the past few months Alyssa has been talking about getting a belly button ring. The piercing was my birthday gift to her, but we still had to find a place to do it. By coincidence on one of our outings with Alyssa’s brother and sister, we passed by her sister’s piercer. We had a recommendation! Later that week I called to find out if it would be possible to get an appointment and to get a price estimate. It was around this time, that I also let myself make a decision I’ve been wanting for a while. For some time, I have been envious of all the amazing tattoos and piercings that I saw around me. I always admired the style, but always stopped myself out of a need to conform. To conform to the expectations of my family, of Alyssa’s family, of what is considered “proper”. For all that I am an outspoken activist, I still feel the need to conform to social expectations. I decided to give myself permission to be as punk as I want to be. 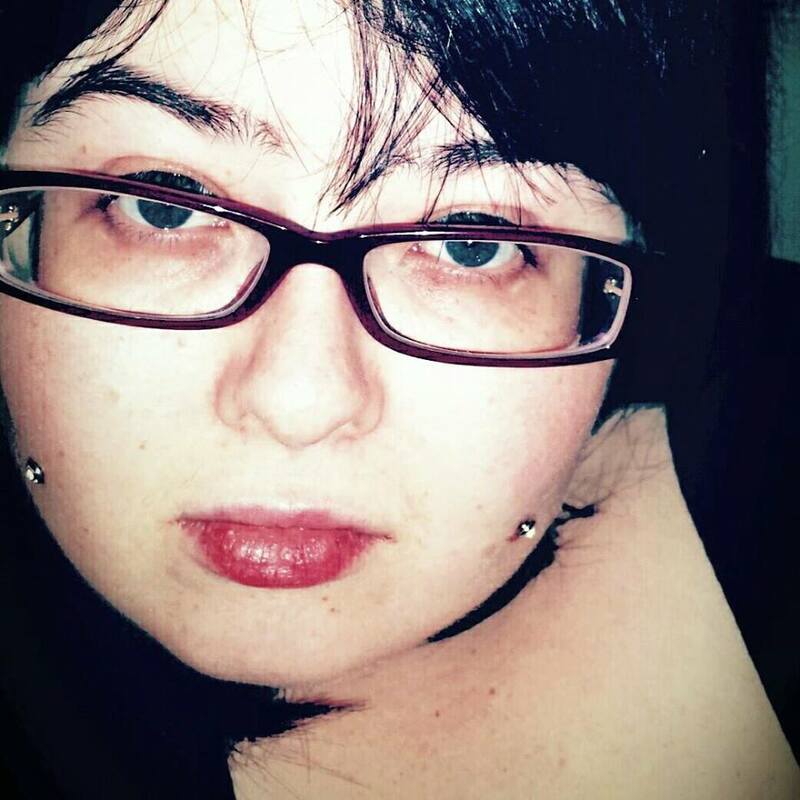 To get the piercings that I admired and give myself permission to make it about my enjoyment of my appearance. I decided to get dermals in my cheeks. Before our appointment, we had dinner with some friends. Excited, we shared our plans with our friends. They joined us in our excitement, showing their support by agreeing to go with us, however, they also expressed some concern. What about Alyssa’s parents? What would they say? This visit home had been one of the best either of us had ever experienced. Difficult subjects that came up did not end in hurt feelings on both sides, nor with anger, but rather with understanding. We were heard and accepted, and in return we felt comfortable enough to hear them out as well. This was a big step for both of us, especially when considering that we needed to build good favour for future discussions. Suddenly my decision provoked anxiety. Alyssa’s piercing could be easily hidden, but what about mine? Dermals on my face would be pretty obvious. That they came only days after our conversation about “living in the real world” and overhearing their disapproval of their daughter’s less usual ear piercing, would seem like deliberate antagonism. Although my decision had nothing to do with them, it had suddenly become political. What followed was almost a parody of what people who are in the closet play out their lives. I got the piercings, but I wasn’t willing to create a scene or risk their opinion of me by letting them find out. And so we played the game of hide the piercings. As we waited to be picked up from the restaurant, we thought about how to explain the Band-Aids on my face. Then it came to me! I had scratched off some pimples/mosquito bites. We hoped that with it being late, the parents wouldn’t notice until either later at the house or the next morning. They noticed immediately. In the meantime, every time we went out, I pulled them off my face to let the piercings breathe, and to show them off to the world. I reveled in the freedom of being able to be who I was. Whenever someone new, a grandparents, a family friend, saw the bandages on my face I had to explain them again. Mima was the only one to comment about the even spacing, but I laughed it off as a funny coincidence. A part of me suspects that the parents weren’t really fooled, but they didn’t mention anything and so everyone pretended to go along with the charade. Because it was something of relatively little personal importance, the situation managed to be funny. I remember exasperating more than once that “I am 27 years old!” The idea that at my age I still had to hide something like piercings from my and someone else’s parents seemed silly. But in a scary sense the relatively insignificant piercing closet was a parable for more significant and significantly more important closets: gender orientation, sexual orientation, religious belief or non-belief, the people we love, are all just some of the many examples. Ultimately what closets are are tiny prisons that remind us that the people who should love us unconditionally may not accept who we are. What makes it scarier that sometimes we wear there prisons as armour to protect us from those who we shouldn’t need to be protected from. The world saw the results of those kinds of prison with the story of Leelah Alcorn. She is not the only one by far. Social Media, the internet, have made it possible for these victims to burst out of their closets for glorious instances of freedom, but sometimes that is not enough. In that time, the internet becomes the place where their real eulogies can be seen rather than the dishonest tripe of those who forced closed the prison doors when they should have been the ones helping them to open. I have heard it said that “we all come out of the closet twice…at least twice” is a running joke among trans women. I imagine it is one said with strength but also a fair amount of sadness. People ask what the harm of jokes that make fun of people of a certain group, of using pejoratives and slurs, of having “personal” opinions that dehumanize people, and the truth is that each of these things along with a lack of representation in media, biased presentations, mocking presentations, each of these and more make up the bricks in the walls of these closets, our prisons. To make the world that Leelah dreamed of, to make a world that is safe for many of us who have to hide who we are, to do this we have to give up the idea that intentions are enough. We have to speak out. We have to DO BETTER. No you are no longer entitled to your own opinion, because your opinion harms, and your discomfort is not worth the lives of our siblings, of our children, of our lovers, of our friends. Dermals are only skin deep, but identities are who we are.